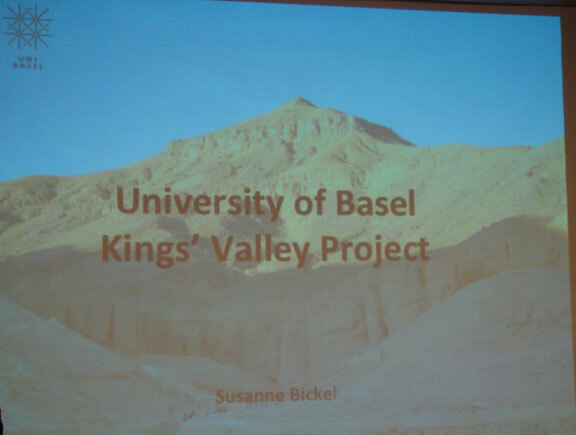 The lecture was not only about KV64 which I think is what most people thought, but it was on the work of the University of Basel and on many tombs. The aim of the project is to analyse the strategy of the use of the area and the entire setup, not only for the royalty of the first three or four generations of use but also none royal burial. 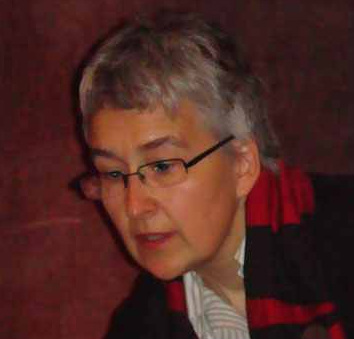 The Basel University’s main research is in two parts. 1. The Society: Who had the privilege to be buried next to the Kings? When was this area used as a none royal necropolis? tombs? Was there a set distance? The architecture? 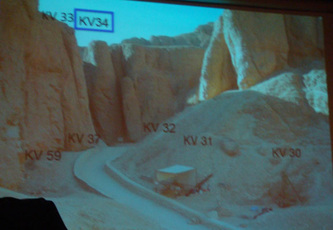 The focal point is Tuthmosis III tomb and the positions of none royal tombs. 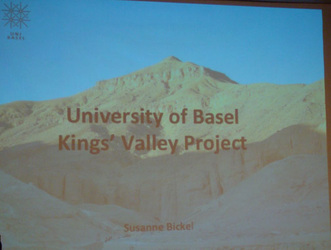 Basel University project started working in the 2000’s. 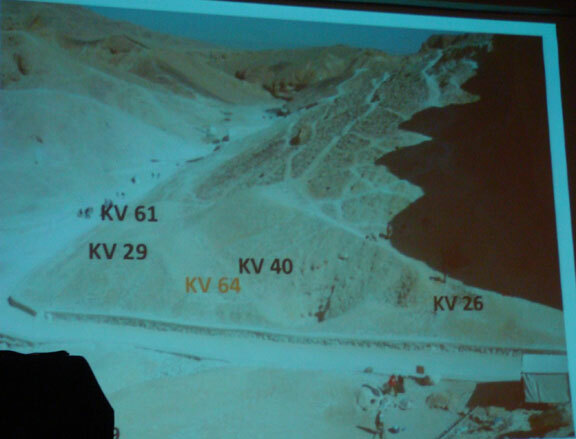 In 2001 they found that the tomb of Siptah KV47 broke into KV32. 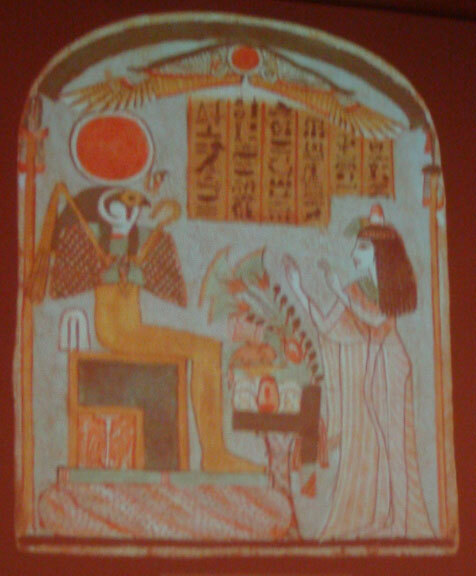 Tomb KV32 was used for a very important person; Queen Tija, mother of Tuthmosis IV. This was the first indication in this little side valley of a none royal tomb being used for a royal family. 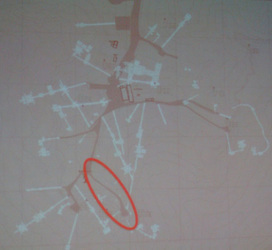 Basel’s Theban Mapping Project. KV29, KV31, KV40 & KV59. Three have been worked on. A shaft tomb of six metres deep. Its corridor was full of debris. There were some modest finds. It was used as a single burial in the 18th Dynasty; Tuthmosis period. KV30 A shaft tomb leading to a corridor and four rooms from a central room. No objects were found, it was totally cleared and cleaned and even a brush was found inside. 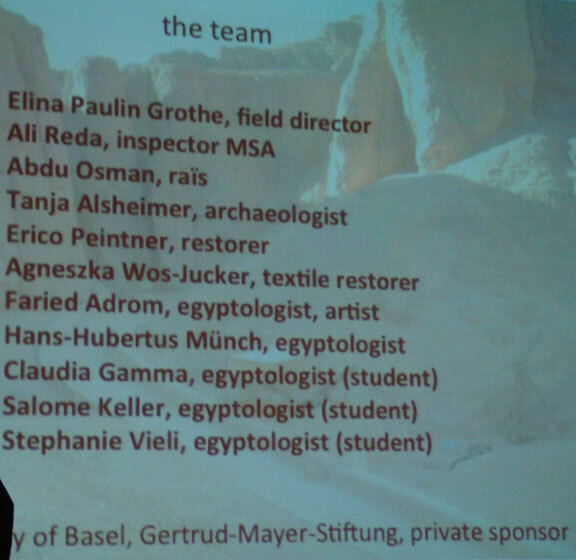 The Basel team had to re-locate this tomb as it was lost. They had to open up a large area to find this tomb again. 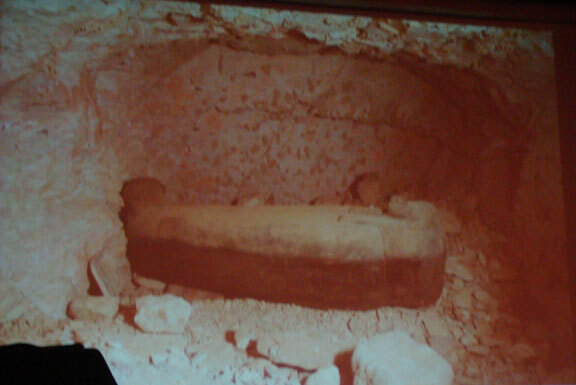 It is small with a single room similar to KV64. It had been severely flooded, not a single object was found in the tomb. Was it ever used? Or was it totally cleaned in modern times? Its hard to say at the moment. A shaft tomb with central room and two lateral rooms. The shaft was filled with fine sand. There were pots of the 18th Dynasty. 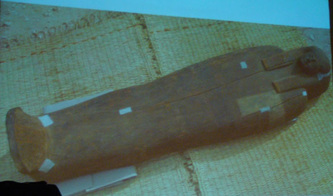 There was evidence of looting, mummies un-wrapped and lots of mummy bandages; some looked new. Large jars and 40 stoppers, an average of ten per person was common. A part of a Canopic jar but sadly the name was not carved on it. It was quite common to make a Canopic jar and leave the name part blank until it was used. 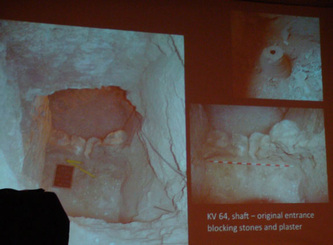 Discovered in 2011 is a shaft tomb. The first corridor was filled with sand and traces of fire. There were four further rooms totally burned-out; probably in the late 19th Century. 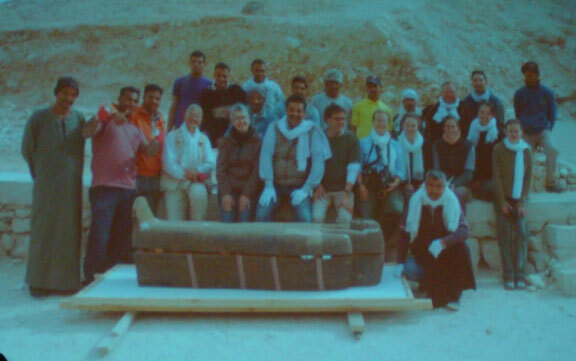 They found forty sculls and remnants and fragments of 18th Dynasty funerary furniture. First used for Tuthmosis IV and then for Amenhotep III. Quite close to Tuthmosis III tomb. KV34 tomb has ten steps leading down to three rooms, well carved, not empty but full of debris. There were no finds, no proof of it being used for burial or who was in it. In 2011, quite unexpected they found this new small thing. They were not sure what it might have been used for. As it was so close to KV40 it was thought to be unimportant and stayed unexplored for a year. In 2012 work on KV64 started. Their first surprise was when they found the blocking stones which was evidence of it not being robbed. They then found the upper part of a corridor. The stones and a pot put it in the 18th Dynasty period. It was probably robbed in the 18th Dynasty and then used as a second burial with sarcophagus and Stelae with face in the 22nd Dynasty. It was filled with debris. The lady buried here was that of Nethemes-Bastet, Singer of Amun, related to the famous priests of Karnak. Her father has the very nice title of Opener of the Sky in Karnak. An upper class elite. The sarcophagus is nicely decorated. It needs further restoration but is of the black type with yellow decorations. 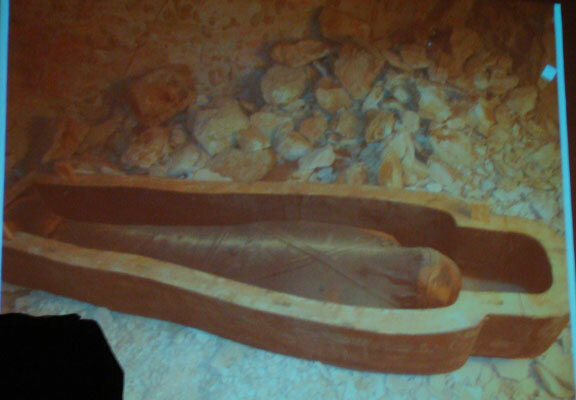 The lady is 1.55 metres and the sarcophagus is over two metres long. 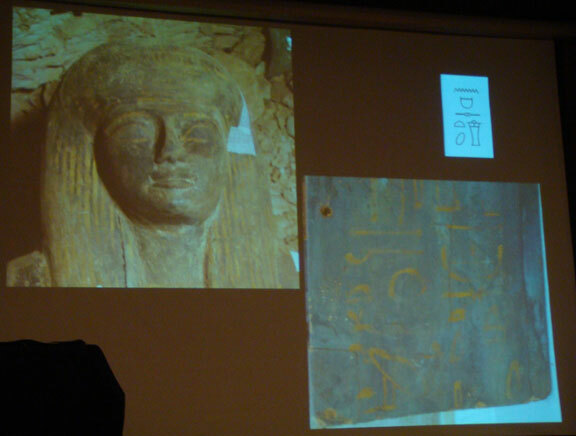 The Stelae has her name on the back and the front is nicely decorated with her name on it – Nethemes-Bastet. So KV64 was first used in the 18th Dynasty for a none royal burial tomb and then a royal with intact secondary burial of the lady, Theban upper class in the 22nd Dynasty. Nethemes-Bastet might be scanned next year after more work is done. Why is this tomb so close to KV40?